This is the perfect way to use up your egg cartons and also makes a great craft for kids! All you need are the bottom half of the egg carton and a few ingredients that birds will love. You can simply fill the cups with bird seed or something a bit more hearty! 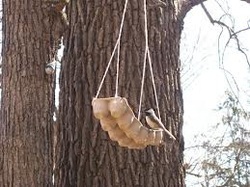 ​Suspend it high enough so that birds don't feel threatened and watch them enjoy! Birds love peanut butter, and here is a quick and simple way to give the birds something more hearty especially in the winter months to help them with energy. In a bowl mix one part peanut butter with 2 parts bird seed. This is a perfect base and you can change it up by adding anything else you know birds would love such as cranberries, raisins, nuts even a bit of bacon grease won't be refused!. 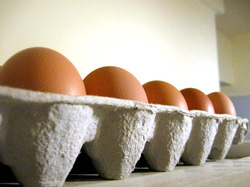 Once you have everything mixed up, spoon the mixture into the egg carton cups. Place carton in refrigerator to harden more, then using twine or something strong simply hang it up in a tree and watch the birds flock. This is a great craft for kids too! You can experiment with different additions, but if you use a peanut butter/bird seed base you will always attract birds.